In its 2016 incarnation, Mofo remains a slippery and amorphous festival. The maverick energy that defined it has not so much diminished as relaxed somewhat, but there’s still that subversive element that hopes to make people think a little while having a fine time among the artworks. Joshua Santospirito’s graphic novel The Long Weekend in Alice Springs has been something of a phenomenon since its modest arrival in 2013. Santospirito’s adaptation of a meandering, meditative essay by Craig San Roque, an Alice Springs psychologist, has gone on to win multiple awards and is now in its third printing. The live reading of the text by its author was accompanied by Santospirito’s delicate and understated improvised guitar that also provided a soundtrack for the projected drawings. 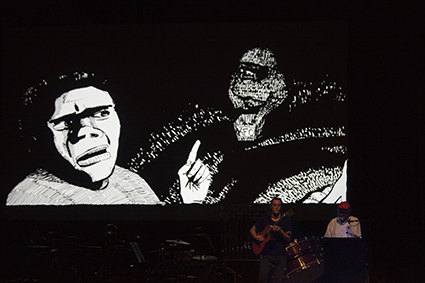 Given much of what makes graphic novels successful is the intimacy of holding the printed book which seems to speak solely to the reader, it was surprising how well this very different iteration succeeded and indeed filled the large space of the Odeon concert hall. It was great to see Santospirito’s images so large, but the real surprise was the reading by San Roque, his presence managing to command attention from a slightly rowdy opening night crowd. For those familiar with the graphic novel, it was a minor revelation, underlining the book’s powerful commentary on the challenges endured by Aboriginal people living in Central Australia. Some of the most radical aspects of Mofo 2016 were to be found in spaces outside this year’s festival hub, Mona. No More Public Space, Only Public Order (water cannon), a performance work and sculptural installation by Amy Spiers and Catherine Ryan, appeared on the Salamanca Lawns on a Sunday morning. 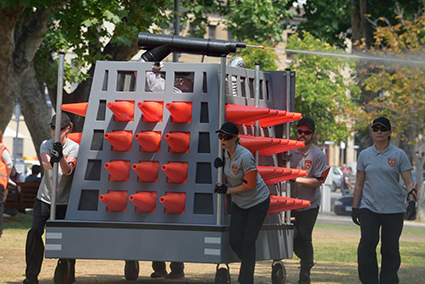 Motivated by the introduction of anti-protest laws by the Tasmanian Government, the work celebrates the arrival of a newly purchased water cannon in a pantomime of the low-rent fascism that has emerged from middle-management and over-regulation. Wearing a high-visibility orange security vest and deftly wielding traffic cone and megaphone, artist Ryan appeared to relish her polite-but-firm marshalling role and held the attention of a crowd who barely noticed as actual police vehicles slunk quietly into place. The water cannon was wheeled in, accompanied by German Shepherd dogs and shrill bagpipe music, and a demonstration ensued. Life sized silhouettes of ‘protestors’ were erected and sprayed with water by now numerous ‘security forces’ with their sunglasses, peaked caps and orange armbands. It was a bit silly and clearly intended as such, but things took a nasty turn when a group of ‘guards’ quite violently beat a fake protester to the ground and tore him up. Looking like a giant Dalek made of safety materials (road cones and fencing) the cannon was uncovered and hurriedly wheeled about the lawn by the ‘security forces’ who had dropped all pretence of politeness and were simply screaming “MOVE!” at the audience. The work was by no means subtle, but its point well made. The water cannon now resides in Kelly’s Garden and may be seen in all its camp glory until 24 February. Contemporary Art Tasmania’s Mofo contribution, the overwhelming exhibition Exhaust, curated by Erin Sickler, was an awful lot of art to take in. 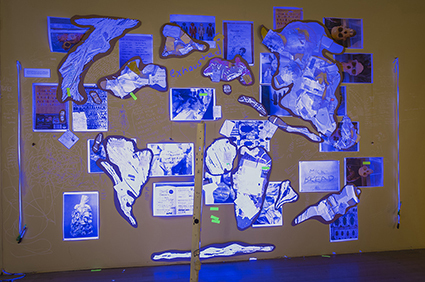 Sickler, a curator and writer from Upstate New York, gathered 15 artists and attempted to examine what it’s like to “work, survive and thrive on a planet in crisis” (from the Exhaust website). This could mean just about anything and, given the extraordinary breadth of content in the exhibition, probably did. The result is a collection of works that, as a whole, imitated the overload of first world life. There was more to be gleaned from dispensing with the curatorial premise (such as it was) and considering the merits of individual works. Sickler assembled artists whose engagement with contemporary art is certainly forward thinking. We’re listening and we can’t sleep—Josh Foley, Ashley Bird and Gillian Marsden’s mixture of torn paper forms and direct scribbling onto a gallery wall—was bathed in a glowing UV light had an urgent DIY energy. Ariana Reines’ beautiful throne, La Pieta, was covered in books, feathers and objects that conjured primitive folk ritual and domestic occult practices. James Newitt’s Conundrum seemed like a map of a mind in decay: terrible thoughts—”a profound and seemingly endless state of depression”—and actions—“self-admission to an institution”—were mapped with pencil on a wall. Among the standout works were Dirk De Bruyn’s Swayers—a lush projection-based work that married analogue and digital forms, such as treated film and found images all tinted with bright colours—and Sally Rees’ archly conceptual Rowan Reynolds Project. Rees had long admired the work of the fellow Tasmanian artist Reynolds and discovered that though she had not been visible in the local exhibiting world she was in fact still working. This project spoke volumes about how we view art and artistic success and was very poignant in the context of Exhaust. “Pulverising” and “bestial” may seem hyperbolic choices for describing the collaborative energy generated by Oren Ambarchi and Will Guthrie. But it was truly monstrous. 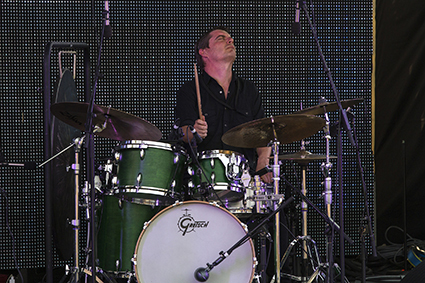 Guthrie’s drumming assault is always astounding, but here he unleashed a wave of ecstatic noise that forced Ambarchi to meet him with a bludgeoning tactic that ripped the air into brittle shards. They made a wall of noise and punched through it in grand style, their sound a true demolition of form. ‘Brutal,’ as young folk say today, but all the more transcendant for it. 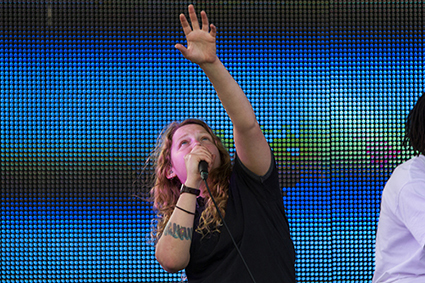 UK artist Kate Tempest is lauded for her performance poetry, but for Mofo she was accompanied by a drummer and a keyboard player, clearly making a transition from her roots to a more populist form. Tempest has been called a hip hop artist, but this is not quite what we experience; her language has a more primal rhythm—not quite as ordered as hip hop in the strictest sense. It’s not that important though, because above all she is astonishingly passionate without being angry (although moments of righteous rage emerge) and she’s hopeful without being naive. She’s seductive, non-standard and even daggy in presentation—there is nothing of the star about her as a performer. Instead you glimpse a real live human being, a magnetic, singular artist who has a way with words and the drive of an activist, directly and indirectly addressing class warfare in many of her pieces. There was a lot more to Mofo 2016, but one more thing warrants mentioning: Amanda Shone’s Viewpoint. 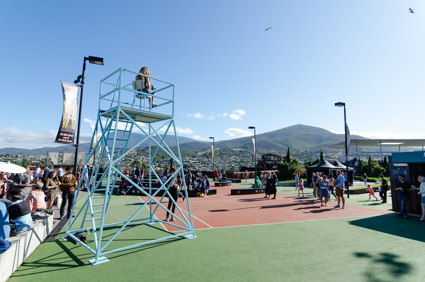 A six-metre-high umpire’s chair that allowed one a moment above the wandering throng, soundtracked with Matt Warren’s pleasant headphone work of soft scrapes and dark but gentle tones that hovered somewhere between tide and traffic noise. Viewpoint provided an exquisite still-point that reminded anyone who sat in it where they were: on the river, below the hills of Tasmania.